As global trade has flourished in recent decades, so have trade disputes. Trading nations have created various forums to adjudicate conflicts, but they are increasingly the subject of controversy. U.S. President Donald J. Trump has long criticized trade dispute resolution panels as unfair and ineffective, particularly those the United States is party to via the North American Free Trade Agreement (NAFTA), which was renegotiated in September 2018 as the U.S.-Mexico-Canada Agreement, or USMCA, and the World Trade Organization (WTO). While some critics say dispute panels undermine national sovereignty, proponents argue they offer much-needed protections that boost confidence in global investment and prevent trade wars. The authority of these supranational bodies is established by agreements such as bilateral investment treaties and free trade agreements, or by membership in an international organization such as the WTO. Parties agree to accept rulings, though enforcement authority and appeals processes vary. These bodies broadly deal with two types of disputes: state-state, in which governments challenge the trade policies of other governments, and investor-state, in which individual investors file complaints against governments. State-State. Most state-state disputes are handled by the WTO system, the primary body governing international trade. Each of its 164 members have agreed to rules about trade policy, such as limiting tariffs and restricting subsidies. A member can appeal to the WTO if it believes another member is violating those rules. The United States, for instance, has repeatedly brought WTO cases against China over its support for various export industries, including one in early 2017 alleging that Beijing unfairly subsidizes aluminum producers. While that case has not been decided, the Trump administration retaliated by unilaterally imposing tariffs on some individual Chinese aluminum producers as well as broader tariffs on all steel and aluminum imports to the United States that are also meant to target Chinese overproduction. The WTO’s forum for arbitration is called the dispute settlement mechanism, which is run by a rotating staff of judges, as well as a permanent staff of lawyers and administrators. The WTO appoints a panel to hear a case if the opposing parties are unable to resolve the issue through negotiations. A panel’s rulings, if not overturned on appeal, are binding on the respondent country. If found guilty, it has the choice to cease the offending practice or provide compensation. If the country fails to respond, the plaintiff country can take targeted measures to offset any harm caused, such as blocking imports or raising tariffs. A number of multilateral institutions adjudicate investor-state disputes, such as the Permanent Court of Arbitration in the Netherlands or the London Court of International Arbitration, but one of the most important is the International Center for Settlement of Investment Disputes (ICSID). Created in 1965 as part of the World Bank, the ICSID has 162 member states, all of whom have agreed to recognize the legitimacy of its arbitration system. Most trade experts see the WTO’s arbitration forum as one of its most successful efforts, helping to institutionalize rules and reduce the threat of trade wars. However, critics, including the Trump administration, have criticized the WTO system on several grounds. 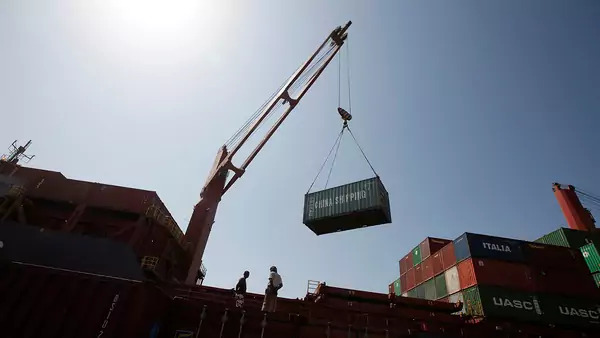 U.S. Trade Representative (USTR) Robert Lighthizer has argued that the WTO has an anti-U.S. bias because more than 150 complaints have been brought against the United States, more than any other country, and it has lost most of those cases. Trump and Lighthizer have also said the WTO is incapable of policing China. The USTR’s 2018 report on China asserted, for the first time, that Beijing’s state-led economic policy is so inimical to global free trade rules that it renders the WTO effectively irrelevant. “No amount of enforcement activities by other WTO members would be sufficient to remedy this type of behavior,” it states. Other analysts argue that the WTO has been increasingly undermined by its most powerful members, including the United States. For instance, the Obama administration ignored a series of unfavorable rulings and blocked the appointment of a WTO judge to the body’s appeals court for the first time. Under Trump, the United States has continued to block appointments to the Appellate Body over concerns that it has exceeded its mandate. In September 2018, the court was reduced to three members, out of seven. If it loses one more, which could happen as soon as 2019, when the next judge retires, it would effectively cease to function, throwing the WTO’s dispute system into doubt. 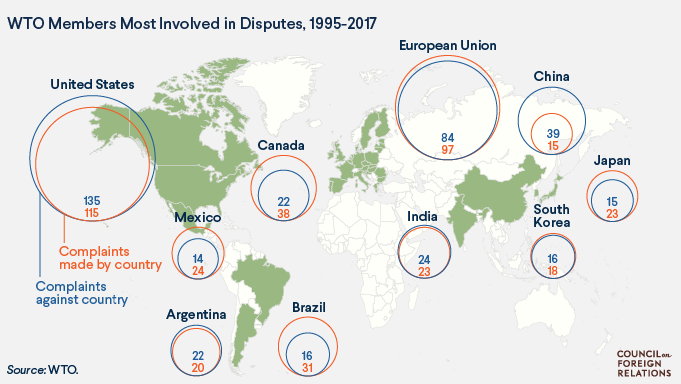 Investor-state dispute tribunals have become a flash point in the debates over multilateral trade deals such as NAFTA, the Trans-Pacific Partnership, and the proposed U.S.-Europe Transatlantic Trade and Investment Partnership. Opponents say that these tribunals erode national sovereignty by allowing foreign corporations to bypass domestic legal systems. In 2017, a group of more than two hundred lawyers and economists warned that such provisions [PDF] give corporations “alarming power” to override domestic legislation, based on the secret deliberations of unaccountable tribunals that have no appeals process. Before the U.S.-Europe trade negotiations were put on hold in 2016, this worry was especially acute among the European public, which feared that ISDS would allow U.S. companies to challenge European Union (EU) rules on labor and environmental protections, food safety guidelines, and other public interest legislation. The Trump administration, too, is skeptical of ISDS, which Lighthizer has called “offensive” for giving non-Americans a veto over U.S. law. In the course of NAFTA renegotiations, which in September 2018 produced the USMCA, the Trump administration proposed eliminating the ISDS provision or making it “opt-in” rather than automatic, which was strenuously opposed by both Canada and Mexico. While the final agreement kept ISDS, its scope was sharply limited and Canada was excluded from the provision; Canadian businesses can’t use it to sue the U.S. and Mexican governments, and U.S. and Mexican businesses can’t sue Canada. Supporters say these concerns are overblown, pointing out that the United States has never lost an ISDS case to a foreign investor and that investors tend to lose more cases than they win. Furthermore, they argue that ISDS protects foreign investments made by U.S. businesses and generally boosts cross-border investment. Meanwhile, the public controversy over ISDS has led governments around the world to experiment with other approaches to investor protection [PDF]. One option is to remove ISDS from some agreements altogether, as countries such as Australia have done, pushing businesses to first pursue challenges through the domestic legal system and then, if unsuccessful, allowing for state-state dispute settlement. The USMCA provides a stripped-down model: jurisdiction will be limited to narrower cases, investors will have to exhaust all local courts first, and all proceedings and documents will be public. In another alternative, the EU is developing an investment court that will operate more like the WTO tribunal system, with a permanent roster of judges, strict conflict-of-interest rules, public proceedings, and an appeals process. The EU and Canada included a version of this in their 2016 trade agreement. Individual trade deals have also created separate state-state arbitration mechanisms. This was the case with the Canada-U.S. Free Trade Agreement (CUSTA), the precursor to NAFTA. CUSTA’s Chapter 19, which was continued in NAFTA, allows for one government to challenge the trade policies of another via an independent, binational panel, which bypasses domestic court systems. NAFTA’s Chapter 19 has proven controversial. Canada insisted on its inclusion in CUSTA because of what it saw as a long history of unfair U.S. trade policies. Ottawa has brought dozens of cases before these panels, many relating to U.S. duties on Canadian lumber. Some trade experts argue that Chapter 19 reduced trade disputes between NAFTA members because it made it likely that any trade barriers would be overturned by the panels. While the Trump administration wanted to remove Chapter 19 from the new USMCA, experts warned that doing so could have led to an increase in duties, especially by a U.S. administration that has seemed eager to apply them, and an uptick in retaliatory trade measures from Canada and Mexico. The deal agreed to in September 2018 maintained the Chapter 19 mechanism as is; however, the USMCA must still be approved by the legislatures of all three countries. This Congressional Research Service report details the history and process [PDF] of international investment agreements. Trade expert Geoffrey Gertz lays out possible scenarios [PDF] for ISDS reform in a renegotiated NAFTA agreement in this Brookings analysis. Paul Ames explores the causes for ISDS skepticism in the European Union in Politico. Several hundred trade lawyers and economists argue against ISDS [PDF] in NAFTA and the TPP in this open letter. Lindsay Oldenski of the Peterson Institute for International Economics argues that investment agreements have been successful in boosting international investment.